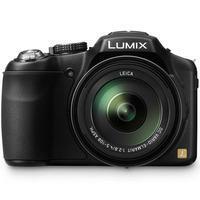 The Panasonic FZ200 is a super-zoom all-in-one camera for enthusiasts who want similar functions of a Digital SLR but without the extra bulk and additional lenses. The improved 12-megapixel high-sensitivity MOS sensor, Venus Engine and ISO sensitivity up to ISO 6400 reduces noise in dimly lit environments and offers superb low-light performance. The 25-600mm 24x super-zoom is accompanied with a wide F2.8 aperture and optical image stabilisation technology POWER O.I.S. which combined will give you crisp, blur-free zoom shots throughout the entire zoom range. With the above technology combined the FZ200 can record stunning 1080p 50p Full HD video and capture stills at 12fps in full resolution. Other features include full manual control, a variety of creative modes, a 3 free-angle LCD screen and a newly developed EVF (Electronic Viewfinder).